Jennifer Silverberg Café Balaban, once a pacesetter, is resting on its laurels. 314-361-6210. Hours: lunch, 11 a.m.-2:30 p.m. Mon.-Fri.; dinner, 6-10:30 p.m. Mon.-Thu., 5:30-11:30 p.m. Fri.-Sat., 5-10:30 p.m. Sun. ; brunch, 11 a.m.-3 p.m. Sat., 10 a.m.-3 p.m. Sun. "Give the place a few more years, and it'll be retro," remarked my dining companion as we took stock of the French advertising posters, track lighting, frosted-glass wall sconces and mirrored paneling in Café Balaban's dining room. With the nostalgic sitcom That '80s Show having debuted last week, he was not wide of the mark. A new chef, Dan Joyce, came on board at Balaban's last fall, so it seemed like a good time to revisit the restaurant. But we discovered that this one-time pacesetter, in business nearly 30 years, is resting on its laurels. And, as any chef will tell you, a restaurant is only as good as the last meal it served. Balaban's is outfitted just as it was when we dined there 10 years ago. Now, that's not necessarily a bad thing -- a classic bistro look never goes out of fashion. But the table settings and furnishings, from the passé flatware pattern to the torn vinyl banquettes, are dated and a bit shabby. The place is clean enough, but it's not in apple-pie order. Take the chef statuette by the entrance: The valet-parking attendants apparently use its pedestal as a repository for their discarded Styrofoam cups, crumpled straw wrappers, Camel Filter King packs and cigarette butts. The restaurant's interior is also in disarray. Bus stations are untidy, and servers are in the habit of ditching tray jacks, serving trays and wine stands in the closest unoccupied spot. Handling this cumbersome equipment is one problem with tray service, which Balaban's still uses. You know the drill -- the waiter lugs a laden tray and a folded tray jack to the table, snaps open the jack, heaves the load onto the frame and transfers the plates from tray to table. This ungainly practice has fallen out of favor except at places such as banquet halls and the Cracker Barrel off I-64. Most upscale restaurants opt instead for hand service, in which the waiter brings customers' orders directly from the pickup window to the table. For large parties, a team of servers presents all the plates at once, timing the delivery with the precision of Esther Williams. Balaban's service may be inelegant, but it's seamless. Our servers knew how to take an order, present a bottle of wine, pace courses evenly and look after details. Their crisp performances don't square with the tattered cardboard menu folders, the crooked sofa paintings, the moldering hunting trophies and the unchecked racket in the kitchen. 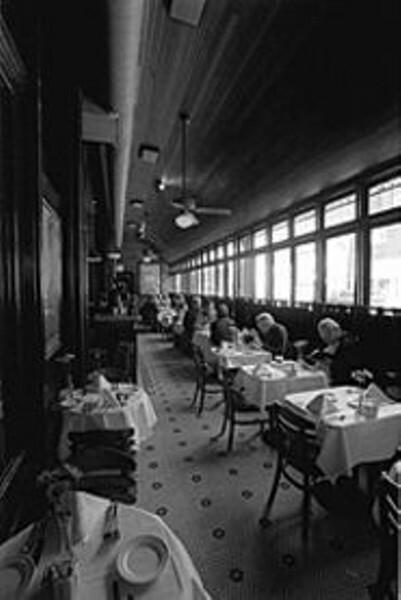 Balaban's two seating areas, designated as the café and the dining room, have separate but broadly overlapping menus. This arrangement allows Balaban's to charge Tony's prices for Houlihan's food. Almost every dining-room entrée, in fact, is in the $23 range. A peppercorn-encrusted beef tenderloin with wild-mushroom sauce that runs $16.95 in the café, for example, fetches $24.50 in the dining room. The difference, says owner Steve McIntyre, is the portion size and the side dishes, but we couldn't tell one vegetable medley from another. Joyce offers an American bistro menu of familiar crowd-pleasers. Barbecued salmon, Spago-style pizzas, jerk chicken and crème brûlée used to be trendy fare, but by now Good Housekeeping runs recipes for them. Joyce relies on ingredients whose 15 minutes of culinary fame has expired -- things such as sun-dried tomatoes, roasted portobellos, Asiago cheese and balsamic vinegar. They still taste fine, of course, but eating them is like wearing shoulder pads again. Why not experiment with today's hot ingredients -- figs, chestnuts, lychees, salt cod, rose water, chai, Hungarian paprika, pistachio oil and gianduia, to name a few? Joyce does draw from many cuisines, and he uses Asian flavorings, such as miso and wasabi, to especially good effect. Even more important, he and his cooks make everything in-house, from pasta and pie dough to spice rubs and sorbet. Look for Joyce's most imaginative dishes on the specials list. And by all means try something new from Balaban's 300-bottle wine list -- red Zinfandel in place of a musclebound Cabernet, say, or white Burgundy instead of an oaky California Chardonnay (they're made from the same grape). Most diners don't give side dishes much thought, but they can freshen plate presentation and echo the flavors in an entrée. Joyce doesn't give them much thought, either. Instead, he serves an all-purpose vegetable medley with many of the main courses -- we ate it three times, in both the café and the dining room. This utilitarian vegetable du jour does little more than take up space on the plate, like a filler song on a cassette tape. Just when we thought it couldn't get any worse, the medley reappeared with a mound of rice pilaf. Our taste buds went numb and we began to feel panicky, as though we had stumbled into a wedding banquet or -- worse yet -- a corporate retreat. If Balaban's wants to resuscitate its reputation as an innovator, such one-size-fits-all shortcuts won't do. When diners cough up 20 bucks for an entrée, they expect the chef to craft complementary sides, such as lamb with braised lentils or salmon with an Asian slaw. The dishes we sampled offered few surprises. On our first visit, seated in the café section, we shared an appetizer of grilled Brie draped with a tart cranberry compote and so-called house-made pumpkin bread, which could have passed for plain crostini. Crab cakes were plated with an avocado-tomato relish and, inexplicably, a quartered cheese quesadilla. Flash-fried Pemaquid oysters were warm and creamy, with thin jackets of cornmeal breading. A lean lamb tenderloin was paired with wonderful roasted-garlic mashed potatoes -- that's one clichéd dish we'll never tire of. Barbecued spiced salmon was dusted with a dry rub as sweet as cinnamon sugar. For dessert, a homespun, juicy blueberry cobbler arrived in its own little tart pan. Out of season or not, it was delightful paired with a scoop of Grand Marnier ice cream. Puffs of raspberry mousse suspended in a bright passionfruit purée were garnished with halved macadamia nuts and charmingly presented with a magenta orchid. On our next visit, we sat in the dining room, where I could gaze up at the rugae on the roof of a boar's open mouth. We began with a popular appetizer that did not particularly appeal to us. Shrimp "dumplings" consisted of semolina dough wrapped around compressed ground shrimp -- we dubbed it "shrimp sausage." Smoked Missouri trout had a flavor similar to that of deli-style whitefish. The trout was flaked, mixed with crème fraîche and horseradish, plopped onto a tepid corn pancake and showered with chives. We turned to the specials list for an entrée of pan-seared diver scallops with sliced fingerling potatoes and leeks. The shellfish were expertly seared to retain their supple, almost gelatinous texture. Jerk chicken was a bit dry, but the layering of chiles and spices gave the bird a gentle heat. To finish, we ordered chocolate fritters to share. We were dubious when the waiter set before us a plate of smooth, naked balls sprinkled with something resembling graham-cracker crumbs. The buff balls turned out to be truffles dipped in a Bailey's batter and deep-fried. (Does good chocolate really need any help?) The sticky, stale bits around them were grandiosely identified as "almond praline." We give these bald orbs the booby prize for homeliest dish and most misleading menu parlance. Joyce's food is fresh, competently prepared and agreeable. But it doesn't wow us. Diners are a savvy lot these days. With Julia Child passing the torch to the likes of Nigella Lawson, it's going to take more than a few wrinkled tomatoes to turn diners' heads.